Does your diving have its ups and downs? Does your buddy have a sore neck from always looking to see where you are? Does your buoyancy control leave a little something to be desired? If so, then the PADI Peak Performance Buoyancy Specialty Course could be just what you need to solve the problem!!! The PADI Peak Performance Buoyancy Specialty Course is designed to assist you in obtaining buoyancy skills far beyond that of the average Open Water Diver. During the course you will learn through knowledge development and practice how to enhance your ability to control your buoyancy and so become more controlled in the water. Once more, your buddy will appreciate diving with you more than ever, knowing that you have buoyancy control far beyond that of the average diver. Don't let your diving have its ups and downs!!! 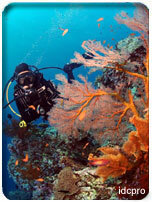 Enroll on a PADI Peak Performance Buoyancy Course with us today and get yourself under control!! !